NewsX1 is the program you need if you trade the news. News trading can be very profitable if you set it up correctly, you will need a broker with (minimum spread or fixed spread or zero spread) and allows news trading. 2,3 or 4 successful news trades per month (not difficult to identify) will leave your account balance in a better position than when you trade everyday, for 'trading's sake'. 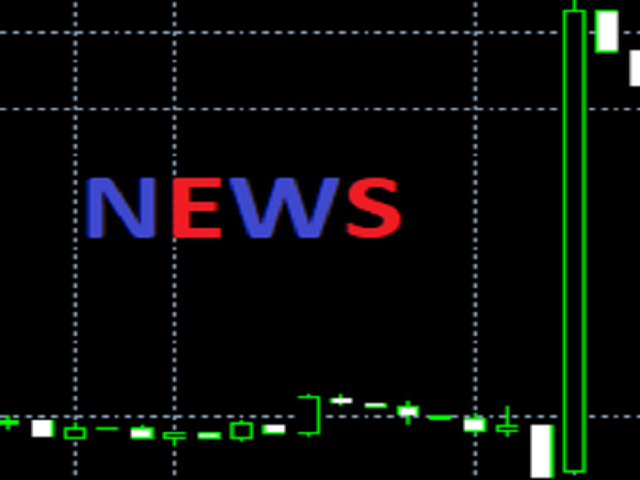 Trade only 'high impact' news with the least volatile currency pair that is affected. NewsX1 takes the following parameters: "localh", "localm", "sprmax", "lotn", "tpr", "slr", "buysellpips". localh & localm are the hour and minute of the news release time according to your local computer time . IMPORTANT: You must synchronize your computer clock to the world clock for your time zone, to the nearest second. If you have to err, err on the positive side, i.e. let your computer clock be ahead one or two seconds, rather than behind. sprmax is the maximum acceptable spread to place a trade , lotn is the size of the trade , tpr and slr are the take profit and stop loss in standard pips . the program places a straddle trade buysellpips above the ask and below the bid 8 seconds before news time and deletes the pending orders 8 seconds after news time. A perfect companion for NewsX1.ex4 would be the "TotalProfitTrailer", allow for a 'good' downtrail since the spike does not go in a straight line , but rather back and forth . Trade when a large spike is expected and choose the currency pair with the least volatility . Some ""gambler"" traders can predict the direction of the spike , those may be interested in the "SellAtMarketTIME" or "BuyAtMarketTIME" . If you can't find them or have any questions drop me an email with the subject line "MQL". You can set parameters, which you don’t want to be active, to non-functional values. For example if you set your stop loss to, say, 500 pips, it will be practically non-functional, since, for the duration of a trade, the price is unlikely to move by that many pips. THE UPGRADE: 8 seconds before news time was used to try and save you from being taken in, in both directions, because of volatility or spread increase. However, I have been informed by some, that some brokers will not accept your orders at this time, so, an additional parameter is included in the upgrade "secsbefore", which allows you to set yourself the number of seconds before news, when your orders will be placed, but it still must range between 8 and 59.